Product reviews on e-commerce websites are meant to serve as a second opinion for items that you wish to purchase online. But with fake reviews creeping up everywhere, not only does it make your decision to buy a particular product more difficult, but also affects your trust on the platform as a whole. You can, of course, read through the reviews manually and decide for yourself whether to trust them or not. But that often requires you to invest a lot of time and effort, especially if there are hundreds of reviews to scroll through. Well, if you frequently shop on Amazon, there are a few dedicated tools to help you analyze product reviews, and spot the ones that could be fake. Here, we’ll discuss about two of them. Fakespot is a web application where you can analyze the reviews of a particular product on Amazon, by simply providing the product URL. The analysis is done based on multiple factors, including the reviewer’s verified purchase, use of excessively positive language date correlation (whether a bunch of similar reviews were posted together on the same day), correlation with other reviewers (whether others are also talking about the same thing), reviewer profiles, purchasing patterns, etc., powered by AI based machine learning algorithms. The end result is that you get a Fakespot score based on the analysis, which are graded from A (most legitimate) to F (least legitimate), based on the quality of product reviews. It also accompanies a Trustwerty™ Adjusted Rating, based on similar factors. That being said, Fakespot’s review scores don’t necessarily indicate the overall quality of the product. Sometimes, people may genuinely be excited about the product, writing a review that may be flagged as fake due to excessive positivity. And Amazon often accumulates reviews of the same product sold by multiple sellers; thus, negative reviews of certain sellers might affect the overall analysis of the product. Fakespot’s analysis is only meant to give you an idea about the possibility of the product reviews being fake. In the end, it’s still up to you to analyze why a particular product is being rated good or bad. The final result provided by Fakespot’s analysis should serve to reaffirm your opinion, rather than influencing your actual decision. Fakespot is available as a web app on their official website. But you can also get Chrome and Firefox extensions for real time analysis. The Chrome extension is available for a free 7 day trial on the Chrome Web Store. Post free trial, you need to register for a $1.99/month subscription to keep using the service. On the other hand, the Firefox add-on can be installed for free. 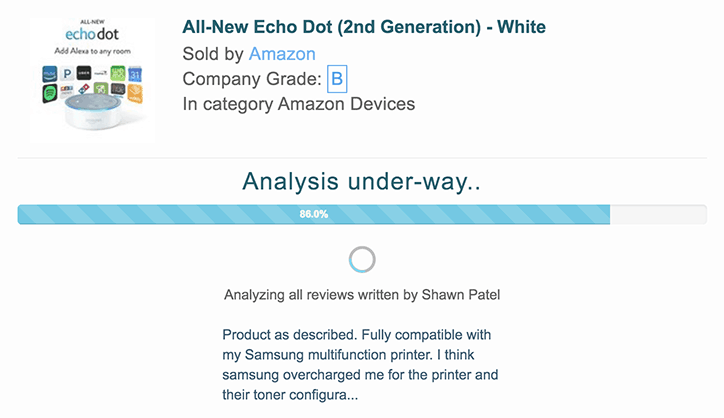 ReviewMeta is a similar fake review checker for Amazon, which provides a more detailed report based on several factors, which might enable you to spot fake reviews more conveniently. However, ReviewMeta currently works on only a few Amazon domains, including Global/US (Amazon.com), UK (Amazon.co.uk), Australia (Amazon.com.au), France (Amazon.fr), Canada (Amazon.ca), Germany (Amazon.de) and Italy (Amazon.it) stores, along with support for BodyBuilding.com e-commerce website. Other Amazon domains are not currently supported. ReviewMeta generates fake review report based on analysis of several factors. It takes into account, the review trend, verified purchases, suspicious reviewers based on their previous comments, language, over-expressed reviews, phrase repetition, and more. To analyze a particular product for fake reviews, one has to paste the product link in the provided space. Once analyzed, the website will generate a report, which should give you a decent idea on the product’s actual rating. To start with, ReviewMeta provides a verdict on the possibility of unnatural reviews being present. This is followed by a comparison between the product’s rating on Amazon, and the ReviewMeta Adjusted Rating based on its analysis of the product. The Report Card section shows you a summary of all the tests conducted on the reviews of the particular product, categorized into Fail, Warn and Pass status. Clicking on a particular test status takes you to the in-depth analysis of the particular test, which includes statistics and graphical representations to display the corresponding trend. Each test analysis is also accompanied with a short description of the results. Once you go through the entire report, you should help you to decide on the quality of the actual product. But it’s always recommended to conduct a personal analysis, rather than depending solely on automated analysis reports. ReviewMeta includes a free Chrome Extension and Firefox add-on to streamline your research process while browsing Amazon products. Alternatively, you can also add the ReviewMeta bookmarklet, which is lightweight and yet provides a similar experience to the browser extensions. Did these tools help you to spot fake product reviews on Amazon? Let us know in the comments below.